Kurt “Frenchy” Yahjian has had the privilege of singing and/or recording with Tony Bennett, Ray Charles, Patti Austin, Cindy Lauper, Darlene Love, Harry Belafonte, Carly Simon, Harvey Fuqua, Felix Cavaliere, Vicki Sue Robinson, Dion, and Ronnie Spector, among others. He has been featured on camera in several major motion pictures, including Jesus Christ Superstar and Hair, as well as many network television shows and specials. 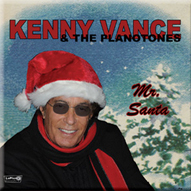 Frenchy’s fans know him from his work with The Inquisitors, and he is honored to have joined the elite ranks of Kenny Vance and The Planotones.